Archimedes' principle states that the upward buoyant force that is exerted on a body immersed in a fluid, whether fully or partially submerged, is equal to the weight of the fluid that the body displaces and acts in the upward direction at the centre of mass of the displaced fluid. 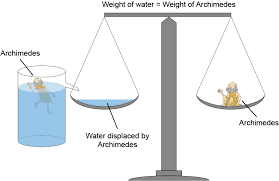 The word displacement and its derivatives was for many centuries associated mainly with that fellow Archimedes. Anthropologists also found the term useful in describing ethnic or national groups who have been removed from an area and possibly replaced by others. It is almost twenty years since the principle of displacement entered the legal domain with the introduction of ASBOs where a civil order made with criminal sanctions if breached could enable miscreants to be banned from any area the court designated. Various other displacement orders have since been legislated eg Drinking Banning Orders followed ten years ago. Offenders were prohibited from a particular area and were pushed into adjoining towns or counties if they wanted to go to a pub. Indeed there have been cases where a recidivist was banned from drinking in any public place in England. Such prohibition orders are just an easy way to avoid constructive answers to habitual offenders such answers to consist in varying percentages of deterrence, punishment and rehabilitation all of which are costly in comparison. The Ministry of Justice and the Home Office has since 2010 cut to the bone the resources necessary for the justice system to function for all of us; law abiding citizens, defendants and witnesses and those who work within the whole system. This recent case is a perfect example.